Illinois 2nd District State Representative Theresa Mah hosts a free Chicago Senior Fest Bus with an 8:30 a.m. pick-up and a 2:30 p.m. drop-off on Thursday, September 13, 2018, at Family Thrift Store, 3542 S. Archer Ave., Chicago. Join McKinley Park neighborhood seniors on the bus for the trip to Senior Fest 2018, which brings together Chicago residents 60 and older for a free day of activities, food, health info, games and more. 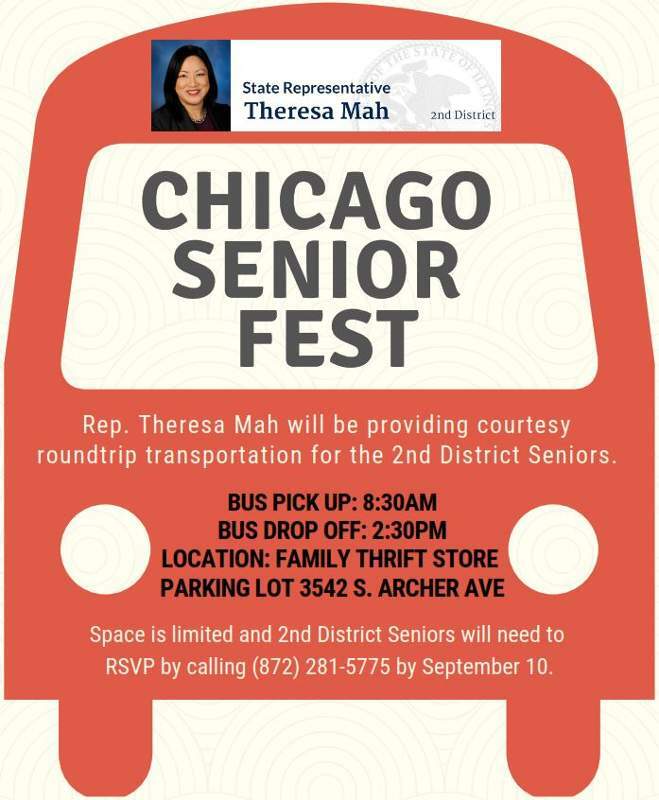 The bus from McKinley Park will pick up riders in the parking lot of the Family Thrift Store at Archer Avenue and Leavitt Street at 8:30 a.m. for the trip downtown and the drop-off at Senior Fest, which runs 9 a.m. to 2 p.m. The bus will return from Senior Fest and drop riders off at the Family Thrift Store parking lot.